You want to remove all the appointments prior to a specific date from your personal “Calendar” in order to make some space in the Outlook PST database (Personal store). All the appointments that are set prior to a specific date can be deleted quickly and when displayed in a tabular format. It displays only the appointments and does not give out the days, weeks and months individually. For this you first need to activate the calendar by clicking on the “Calendar” tab from the Navigation field. Then go to the “View” tab, click on the “Change view” button and select the entry “List” in the following menu. Now the next step is to sort the displayed appointments in accordance with the beginning or end period. Check whether Outlook has correctly sorted the appointments in a descending chronological order and if necessary click one more time on the column heading till it is arranged in a correct order. Now, look out for the first entry of the date in the list where you would want to delete the appointments prior to this date and mark it. Then keeping the “Shift” button pressed mark the last entry. All the appointments in between the first and the last selected entries will be automatically selected when the shift button is kept pressed during the selection. Now, delete these appointments by pressing the [Delete] button. 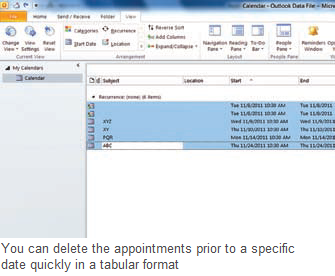 With this, Outlook automatically moves the deleted appointments to the folder “Deleted Items”. You can still restore the deleted appointments if this folder is not emptied.